Smartphones are a major target for malware developers, especially ones running the more open Android platform. A recent study shows that over 32.8 million Android devices are infected with malware. And though anti-malware software exists to keep your device safe, not all mobile security apps are created equal. 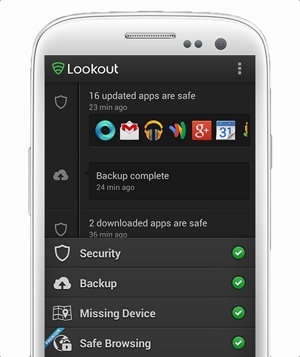 One of the most popular and best-rated mobile security apps is Lookout. And starting today, the Lookout app will come preinstalled on every Android phone sold by AT&T. “With Lookout, AT&T customers can have the confidence to use their phone to its fullest capability, and rest assured knowing they are protected no matter what they do,” explains Lookout VP Tim Roper. What makes Lookout so great? For starters, it works well as an anti-virus program – not perfectly, but well. It also has tools to help shield your device from intruders, manage your app privacy settings and recover your phone should you lose it. Lookout is a free download for both Android and iOS devices. To learn more about Lookout or to download the free app to your smartphone, visit lookout.com. For more on mobile security, check out our What You Need to Know about Mobile Security guide.